1. You will need two paper plates for the body of the turkey. Cut the first paper plate to make the neck and stomach of the turkey as shown in the picture. 2. Glue that paper plate to another paper plate to make a holder. 3. Use the left over part of the cut paper plate to make the turkey's wings. Glue them to the turkey body. 4. Use a white crayon to draw small white lines all over the turkey. Then paint over the entire turkey with brown and other turkey colors. The white lines will show through. 5. When the paint is dry use a black marker to draw black lines on the turkey's tail feathers. 6. 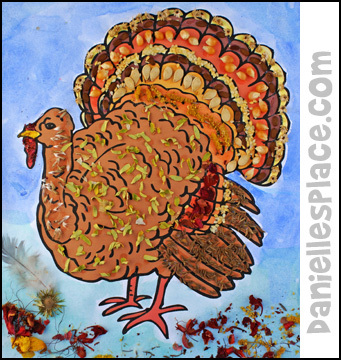 Draw a turkey head and feet onto card stock, color it and then cut it out. 7. Bend down the neck and glue the head to the neck as shown in the picture. 8. To finish glue the feet to the bottom of the turkey. 9. 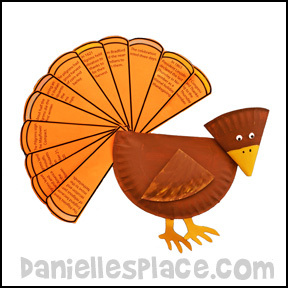 Cut turkey feather shapes from construction paper and have your guest write things they are thankful for on the feathers and them place them in the turkey. 10. At dinner time read what is written on the feathers. You can make it a game and see if your guests can guess who wrote the words on each feather. This is a great art project for teachers who teach first grade and older children. 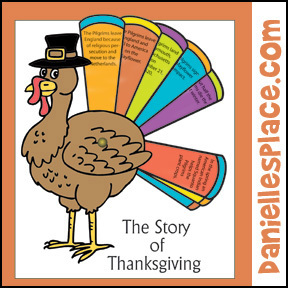 Use it to teach children the history of Thanksgiving and how we celebrate the season. 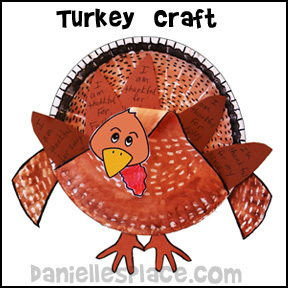 Use the crafts to decorate bulletin boards or send them home with your students to decorate their own Thanksgiving tables. 1. To make the turkey's body roll one paper plate into a cone shape and staple it closed. Cut the bottom off the wide end of the cone so that it is even all the way around. See picture to the right. 2. Fold the pointed end of the cone down 2 inches to make the head of the turkey. 3. Cut wing shapes from the left over part of the paper plate you cut off the cone and glue them to the body as shown in the picture above. Paint the turkey's body. 4. Cut the turkey's caruncle from red construction paper and the feet from yellow or black construction paper. Glue the feet to the inside of the cone as shown in the picture. Glue the caruncle to the underside of the turkey's head. 5. To make the turkey's tail feathers fold another paper plate so that one side is about 1 1/2" from the opposite edge of the paper plate. Cut the paper plate at the fold. Paint the paper plates and then glue them together. Then glue them to the back of the turkey. "I'm A Turkey!" is another great book by Jim Arnosky, author and illustrator of over 100 wildlife and nature books for kids. In this book Arnosky illustrates a song about turkeys. 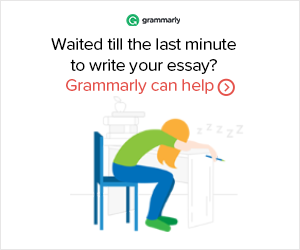 It's fun and catchy yet very informative. You can even Download the Song sung by the author from Scholastic's web site. 1. Print out the turkey picture onto card stock. 2. Have your children color the picture and then glue seeds from plants they have collected. Take them for a walk in the woods or around the neighborhood with some harvest bags. Have them look at trees, flowers, and weeds to see if they can find seeds or other plant material that they may want to use on their pictures. 3. 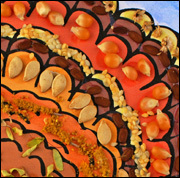 If you can't go outside, you can use seeds from fruit, dried beans, peas, herbs, or even cereal to decorate the turkey. 1. Draw and color a picture of a turkey without tail feathers on a piece of paper. Cut around the back end of the turkey where the tail feathers would go. Instant Download Pattern $2.00 - Feathers patterns available in color and black and white. 2. Cut out some tail feather shapes and write one sentence on each feather about the story of Thanksgiving or use the patterns, below. 3. Place the feathers in order, punch a hole at the bottom of the feathers with a hole punch, and punch a hole in the middle of the turkey's body. 4. Insert the feathers in the slit you cut around the turkey's body and place the brad through the hole in the turkey's body and the feathers. Glue the whole picture to a piece of construction paper. Place glue only at the sides so that the feathers will be able to move. Patterns for this craft are available to members and as an instant download. 1. Place two snack-size plates together, top-to-top. Cut about 1/3 off the tops of the plates and glue them together to make the turkey's body. Do not glue 1 1/2" from the top left-hand edge of the paper plates (where the tail will be attached). You will need this area to spread out the feathers. Leave the cut edge of the plates open. You will use this to store the turkey's tail feathers. 2. Cut another snack-sized paper plate in half. Fold one half in thirds to make the turkey's head. Fold the other half in half to make the turkey's wing. 3. Paint the head, body, and wing and glue them together as shown in the picture. Glue on google eyes. 4. Print out the feet pattern and use it to cut feet from yellow construction paper. Glue the feet to the body. Cut a waddle from red construction paper and glue to the turkey's face. 5. Print out the tail feather patterns onto colored paper. Cut them apart and place them in order in a pile with the beginning of the story on the top. (You can also print out the feathers without any words to make up your own story or use them to write things on them that you are thankful for. 6. Punch a hole at the bottom of the feathers with a hole punch, and punch a hole in the top left-hand side of the back paper plate where the tail should be attached. paper plate and open up the prongs to secure it. The feathers can be stored inside the turkey's body. 1. Glue two large plates together and two small plates together top to top. 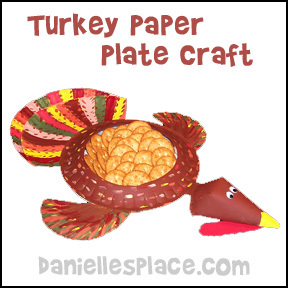 Glue the small plate to the side of the large plate to make the turkey's head. Fold two small plates in half and glue them to the turkey's body for the wings. Cut a small plate in half and then fold it in thirds for the beak and glue it to the head. 2. Paint the turkey's body brown and the beak orange. 3. Print out the pattern and use them to cut from yellow construction paper. Glue them to the body. Cut a waddle and hat shape from construction paper and glue to the turkey. 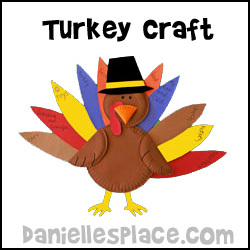 Cut feather shapes, 3" x 12", from different colors of construction paper and glue them to the body of the turkey. 1. 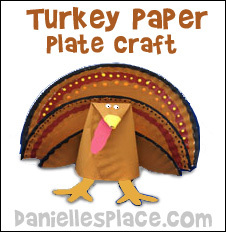 Print out the turkey napkin holder pattern and cut it out. Glue the strip of paper pattern to the back of the turkey pattern. 2. Lay a napkin out flat on a table. Fan fold the napkin using 1/2-inch folds. Fold the fan-folded napkin in half (Diagram 1) and then fold up the folded end two inches (Diagram 2). Wrap the strip of paper that is attached to the turkey pattern around the folded end of the napkin (Diagram 3). 3. Spread out the napkin to form a fan and tape the edges in the middle together so it stays in a fan shape. 1. 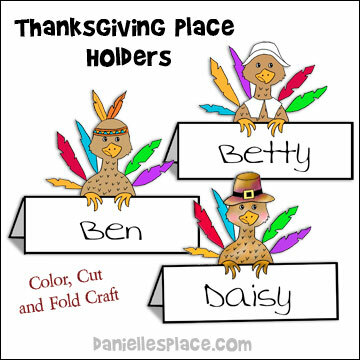 Print out the turkey patterns, color the pictures and cut them out. 2. Fold back on each line to make the placeholders stand up. Glue the bottom fold to the back of the top fold to form a wedge shape. 1. Paint the egg brown and the golf tees orange. When they are dry stick the golf tees into the eggs as shown in the picture. 2. Glue feathers to the back of the egg and two foam leaves to the sides for wings. Cut a beak shape and waddle from fun foam and glue to the egg. Glue on googly eyes. 1. Paint the foam marshmallow and craft spoon brown. 2. Glue the craft spoon to the front of the marshmallow as shown in the diagram on the right. 3. Glue foam leaves to the back of the marshmallow for feathers. Glue two leaves to the sides for wings. 4. Cut the tips off of two yellow oak leaves for the feet and glue them to the bottom of the marshmallow for feet. 5. Cut a waddle from a red leaf and a beak (diamond shape) from a yellow leaf. Glue them to the craft spoon as shown. 6. Cut a hat shape from black foam or colored paper and glue on a yellow band. Glue to the turkey's head. 1. Decide what you would like to draw on the pot holder and draw the picture with a pencil. 2. When you have the picture the way you would like it to look, trace over it with permanent markers or fabric paint. Children help the squirrel count his blessings and then think of ways they have been blessed. 1. Children can send notes written on the leaves to their friends. They can write one word on each leaf and see if their friends can put the leaves in order to find figure out the message. 2. Children can write their vocabulary, math facts, or spelling words on the leaves and use them to review. 3. They can use them on Thanksgiving, and write thankful things on the leaves. For directions to this craft go to the Fall Crafts Page. Candy and Crackers are placed in the basket to represent different parts of the Thanksgiving story. Children color the baskets and then staple the sides together by overlapping the pointed ends. Staple the basket handle to the sides. Print out the basket patterns. Introduce each of the following objects and ask your students how they might relate to the First Thanksgiving story. Chocolate Earth Balls - The pilgrims lived in England where the king made all the laws and the people had to obey them. He told them what church they had to go to and how they had to worship. The pilgrims believed that they should be free to worship God the way they wished. When they heard about the New World in North America they thought it would be a great place where they could go and live in freedom. Tiny Twist Pretzels - The pilgrims believed in God and felt that they should be free to worship God the way they wanted to. They should be able to pick their own pastors and make their own laws. The pretzels represent praying hands. The pilgrims prayed for a place they could go to be free to worship God the way they wanted to. They prayed for Gods protection on their trip across the ocean and for God to help them in the new land. Oyster crackers or Other Dried Bread and Jerky - If the weather was bad on the Mayflower, the pilgrims had to eat cold biscuits and salted meat. Stick Pretzel - The pilgrims cut down trees and used logs to build their homes. Mini Marshmallows - Reminds us of snow and the first winter in the new land in which only half the pilgrims survived. Candy Corn and Gold Fish Crackers - Squanto showed the pilgrims how to grow corn by placing four seeds into a little mound of earth and placing fish around the seeds. 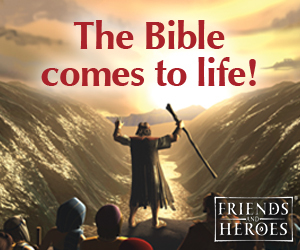 Life Saver Candies - God helped the pilgrims survive in the new land. He sent Squanto to help the pilgrims and show them how to find food. He was their life saver. Maple candies - Squanto showed the pilgrims how to tap the maple trees to get their sap. Teddy Grahams - The pilgrims had to learn to defend themselves against wild animals like bears. Trix Fruity Flavors or Other Fruit Shapes or Dried Cranberries - Squanto taught the pilgrims where to find wild berries and fruits and how to dry them for the winter. 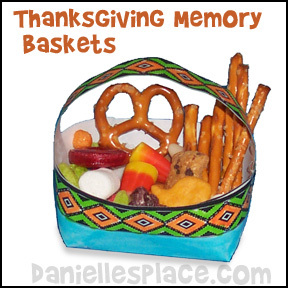 Use these baskets to thank people in your life that have helped you in the past year. Place treats such as cookies, candy and small gifts in the basket with a "thank you" note. 1. Print out the pattern onto card stock. A pattern for this craft is available to members and as an instant download. 2. Color the basket and handle if you are using the black and white pattern. 3. Cut out the pattern along the outside of the box. Cut four slits where indicated on the pattern. Fold all the tabs in to form the box. 4. Glue the sides together so that the printed tab is on the outside. Glue the handle to the inside of the basket as shown in the picture. 5. Cut a small piece of tissue paper and place it in the basket. Add candy or other treats. 6. Write a short "thank you" note and place it in the basket with the treats. "One candy corn just for me. Two candy corns make me smile with glee. Three candy corns of yellow, orange, and white. Four candy corns I hold in my hand to share. Five candy corns I place on my plate with care. A star, a star of candy corns so sweet. Thank you, God, for this special treat. You will also find other crafts and activities to go along with this theme on the members only section: a candy corn rhyme, math, and baking. ©2009, Digital by Design, Inc. -*See Copyright Information - It is illegal to copy this poem and place it on another web site even if you include the author. The Bible Verse in the Frame is - "How sweet are your words to my taste; they are sweeter than honey." (Psalms 119:103) Written on the candy corn shapes. are great tasting words for the soul such as: peace, love, joy, forgiveness, faith, trust, etc. Go the the Candy Corn Crafts and Activities Page for directions and a pattern. 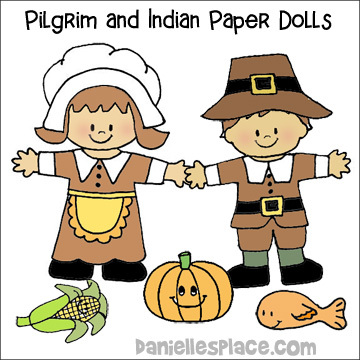 Children will enjoy reenacting the Thanksgiving story with these adorable paper dolls. The patterns include: A woman and man pilgrim with hats, corn, pumpkin, male and female Indian with head dresses and a papoose, horse, fox, fish, and, of course, a turkey. 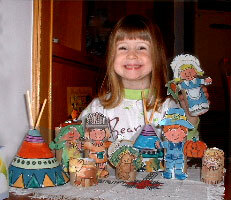 Pilgrim and Indian Paper Dolls Available to Members. 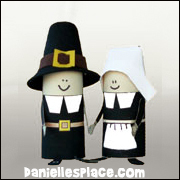 These cute paper dolls come with all kinds of accessories, turkey, hats, head bands, horse, papoose, pumpkins, and more. 1. Print out the pattern or make your own design using the pattern as a guide. 2. 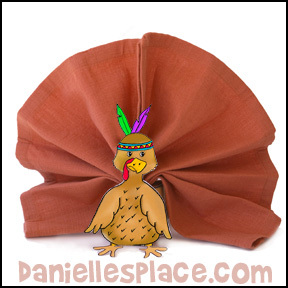 Color the teepee and write the names of the people who will be sharing your Thanksgiving dinner on each teepee. 3. Tape or glue three toothpicks onto the back of the teepee at the top. 4. Curl the pattern into a teepee shape and tape the back closed. What you will need: Craft spoons, wiggly eyes, wooden shapes for the turkey's wattle and beak, red, brown, black, and white paint, and glue. 1. 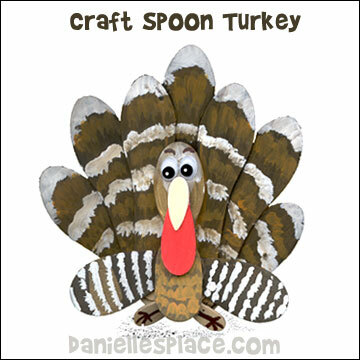 Use the pattern provided to glue the craft spoons together to form the turkey's body. Cut the skinner part off of two craft sticks to form the turkeys wings. 2. Glue on wiggly eyes. 3. Paint a teardrop shaped wooden piece red and glue it on to the turkey as shown. 4. Glue on a smaller teardrop shaped piece upside down to form the beak. 5. Glue onto smaller craft sticks on each side of the turkey's head and neck to form wings. 1. Cut the bottom off the grocery bag so that it is about 8" high. 3. Fold back the edges of the side that you just cut about two inches. Do it two times. Now paint the hat white and staple or glue on some ties. If you don't have time to make a hat you can just tie a white scarf on the pilgrim. The Pumpkin Patch Parable is a charming story for children that illustrates how a loving farmer can turn a simple pumpkin into a simply glorious sight. Liz Curtis Higgs weaves a beautiful parable as the farmer picks out a special pumpkin from his garden, and scoops out all the messy "goo" to make room for his light to shine from inside. In the same way, God's transforming love can fill each of our hearts with joy and light. Liz Cutis Higgs originally created this parable as a way to share the Good News with her own precious children each harvest season. After 10 years, she has touched children everywhere! Recommended for children preschool to first grade. 1. Print out the pattern and the pattern and cut them out. Trace the tail feather pattern onto a dinner sized paper plate and cut it out. Then cut away the outside pattern to make the smaller pattern. Trace that pattern onto another dinner sized paper plate and cut it out. 2. Cut the center out of one dinner sized paper plate. You may want to use a heavy duty paper plate for this part of the turkey. Turn the paper plate with the hole cut out right side up. Glue the smaller tail feather onto the paper plate so that the feathers are curved downward. (See the picture above.) Glue the larger tail feathers onto the smaller tail feathers so that it is curving downward also. 3. Cut out a wing shape from another large paper plate so that the outer part of the wing is cut from the outer edge of the paper plate. Use that wing as a pattern to make another wing only turn it upside down so that both wings will be curved in the same direction when you glue them to the paper plate. Glue the wings to the paper plate with the tail feathers as shown in the picture. 4. Cut a 1" by 4" rectangle to make a neck from the left over circle you cut from the inside of the paper plate. Glue that onto the same paper plate that you glued the tail feathers and wings. 5. Turn another dinner sized plate upside down and glue it onto the paper plate with the tail feathers, wings, and neck glued to it. Turn the whole thing over. 6.To make the head use the head pattern to cut the slits out of a small snack sized paper plate. Roll the paper plate up so that the beak comes to a point and glue where indicated, overlapping the sides of the paper plate. Glue where indicated on the pattern and bring the flap you created by cutting the two slits over the two glued areas. Glue the head to the neck. 7. Paint the turkey. Glue on googly eyes and a waddle cut from red fun foam or construction paper. Add crackers or other snacks to the bowl. 1. Print out the patterns and cut them out from construction paper. 2. Cut the lines on the tail feather layout pattern by folding the pattern in half and cut two layers at once. Be careful not to cut the ends. 3. Show older children how to weave feathers into the turkey tail pattern. Glue or tape the tail feathers to a balloon. 4. Glue the wattle and beak to the body pattern. Draw on eyes with markers. 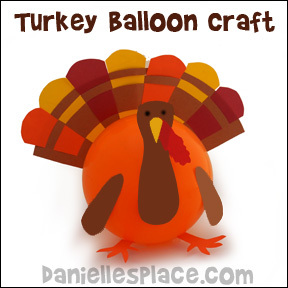 Tape or glue the turkey's feet, neck and wings to the balloon. Watch Logan help his Dad make Balloon Turkeys for Thanksgiving. They put a special surprise in each turkey. On Thanksgiving they popped the turkeys to reveal the prize! The Resource Room is designed for Sunday School teachers and home school parents. All of the crafts on The Resource Room are biblically based . 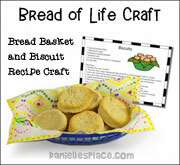 Most of the crafts go along with one of the Bible lessons found on The Resource Room. All the crafts were designed for preschool and elementary age children. All the crafts are original and inexpensive which are great for home school use and large groups such as Sunday school classes and vacation Bible school. Children glue objects in the book to complete each page. 1. Play a Matching Game - Print thanksgiving pictures such as: pilgrims, Indians, fish, corn, a papoose, dog and pony. Glue them onto cards and play a match game with them. 2. Play a Toss game - Make eight of the teepee place holders shown above and mark them with numbers, 5 points, 10 points, etc. Make rings from pipe cleaners. Have the children throw the rings over the teepees to score points. 3. Play Pin the Tail on the Turkey - Draw a turkey without feathers. Cut out feathers from construction paper. 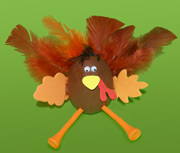 Place double sided tape on the feathers and have the children try to tape them onto the turkey blindfolded. 4. Play a Bean Bag Game - Make no-sew pumpkin bean bags. Just glue them together and then decorate them on the outside. Draw a Thanksgiving theme picture on cardboard and cut holes in it. Children can throw their bean bags at the picture and try to get them through the holes. 5. Fishing Game - Children fish for items they can put into a cornucopia like pictures of apples, corn on the cob, little pumpkins, grapes, etc. Attach a paper clip to the end of the line for a hook so the item cab be attached (and removed) easily. As they lower their line on a pole over a wall, (or some kind of poster board) a person on the other side attaches a picture to the hook. Then the lucky fisherman can place their prize in the cornucopia. 6. Unscramble the Words - (For older kids) Write words related to Thanksgiving such as: pilgrim, turkey, and feast on cards with the letters all jumbled up. The kids try to unscramble the words. Or they can match the scrambled words to the correct counterparts on a list. 7. Write the Word THANKSGIVING on the board and see how many words you can make out of it in a 5-minute relay race. 8. How Much do You Know About turkeys? What is female turkey called ? Where will you find the turkey's wattle? Where will you find the turkey's caruncles? Where is the turkey's snood? About how long does it take a domestic turkey to grow from birth into a turkey that is plump enough for market? 1. A male turkey is called a gobbler. 2. A female turkey is called a hen. 3. The wattle is the flabby skin growth that hangs from the turkey's throat. 4. The caruncle is the growth of skin that dangle from the turkey's chin. 5. The snood is the growth of skin that droops over the gobbler's bill.